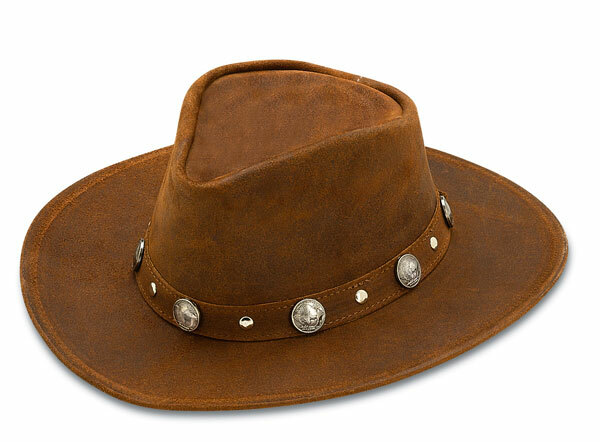 Minnetonka 9513 - Brown ruff distressed leather and Buffalo Nickel metal accents on band. 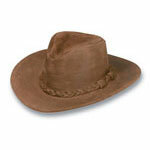 Made with steel wire hidden in the edge of the brim allowing for personalized shaping. Other colors available. 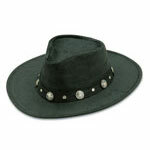 Tip your hat to distinctive western style. This durable classic is handmade from genuine ruff leather that keeps the sun and other elements out. A band wraps around with studs and unique Buffalo nickel metal accents with a small tie in back. 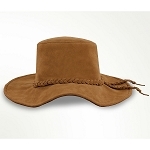 Personalize this wide brimmed hat by shaping it to suit your style. 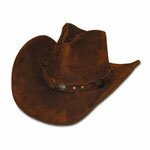 The brim has hidden steel wire, so you can wear this western hat any way you want. The hat I have been looking for is even better with Cherokee Friends addition. 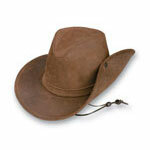 The hat itself is a great buy.